100% Natural Non-Surgical Hair Replacement for Men. Now you can forget you ever had a hair loss problem. Our exclusive state-of-the-art Transitions Hair Replacement System for Men is the latest in state-of-the-art hair restoration and replacement solutions designed specifically to meet your individual and specific hair restoration needs. By creating a perfectly customized non-surgical hair replacement solution designed to meet the individual and specific needs of each client, Transitions Men’s Hair Replacement systems offer the completely natural look and feel of real 100% human hair that goes with you everywhere. The result is so incredibly natural that you can have any hairstyle you want and forget you ever had a hair loss problem. Custom Hair Replacement for Men – Richmond, Va.
Transitions Hair Replacement for Men is virtually undetectable to both sight and touch because it is made from the finest 100% natural human hair and perfectly matched to your exact age-appropriate specifications, based upon your desires and expectations, and customized to your individually unique lifestyle. 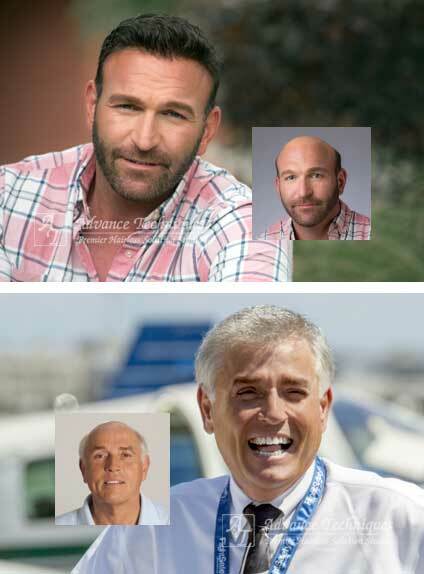 Whether you are an active young adult, middle-aged businessman, or whatever your age may be, Transitions for Men offers a personally customized hair replacement solution for your specific type of hair loss. Transitions hair replacement systems offers a natural front hairline, age appropriate density and an uninterrupted scalp. And best of all, you can have the same total coverage of your scalp as you had before you started going bald. No one will ever know that it’s not your hair growing out of your own scalp. Look closely at the Transitions hairline: Individual hairs emerging from the scalp, in light density following an irregular pattern. This is how a real, growing hairline looks. 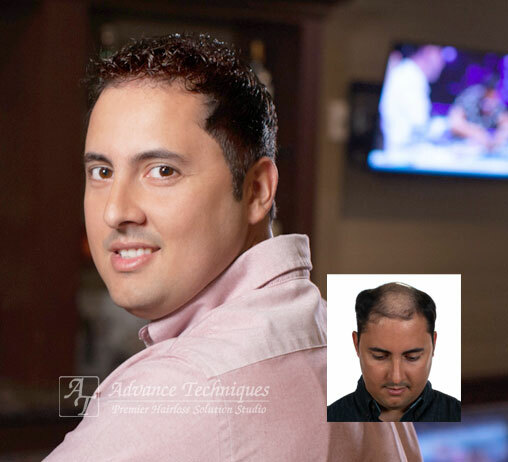 The Transitions hair replacement system, available exclusively in the Richmond, Virginia area at Advance Techniques, offers a naturally appearing front hairline, perfect natural hair density based on your age and existing hair, where the scalp appears normal and visible even when the hair is parted. That is, there is no perceptible change in coloration, appearance or feel between the original hair and scalp and the Transitions hair replacement. Transitions is truly a breakthrough in men’s hair restoration solutions, providing an extremely effective solution for hereditary male pattern hair loss, as well as thinning due to factors such as accidents, medical treatments, or systemic disorders. However, Transitions is not for everyone. Approximately 90% of men may be appropriate candidates for this type of hair replacement solution.